How to upload flipbooks to 1stFlip Cloud? 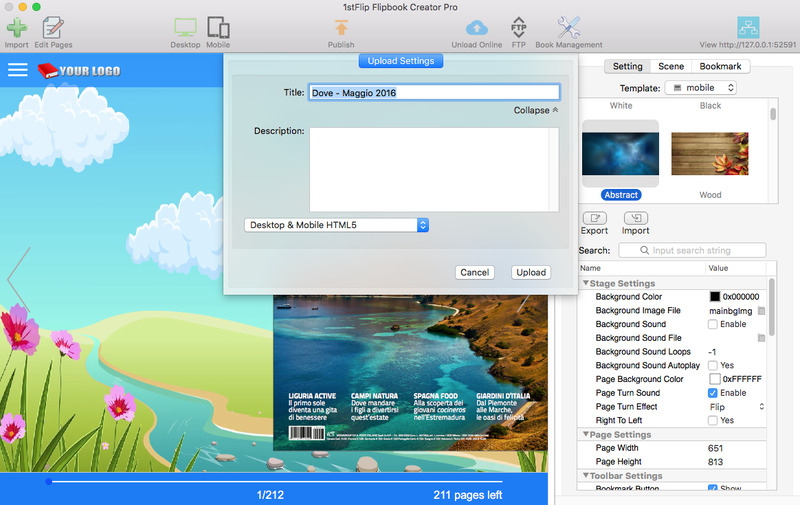 Besides publishing offline flipbooks as html, zip, APP and EXE, 1stFlip HTML5 flipbook maker allows users to easily upload flipbooks to 1stFlip Cloud within the flipbook creator software and get the unique URL. 1. After importing PDF files and customizing the flipbook, click the Upload Online button. HTML5 Flipbook Maker will ask you to create an account first. Enter your email and password to create an account. 2. Now you can add title, description to your flipbook for SEO. You can also choose to create Flash(desktop)-HTML5(mobile), Flash or HTML5 flipbook. Click Upload button. 3. 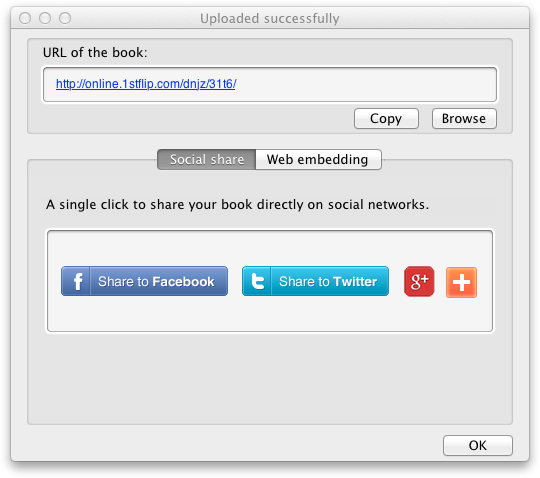 After uploading, the following window appears, showing you the URL of the flipbook. Besides, you can one-click to share the flipbook to Facebook, Twitter, Google+ and other social networks. 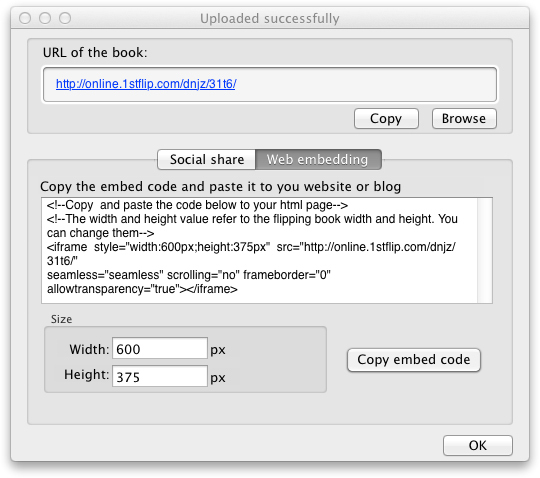 Click the Web embedding tab; copy the code to embed the flipbook to your webpages or blogs. You can change the width and height of the flipbook. 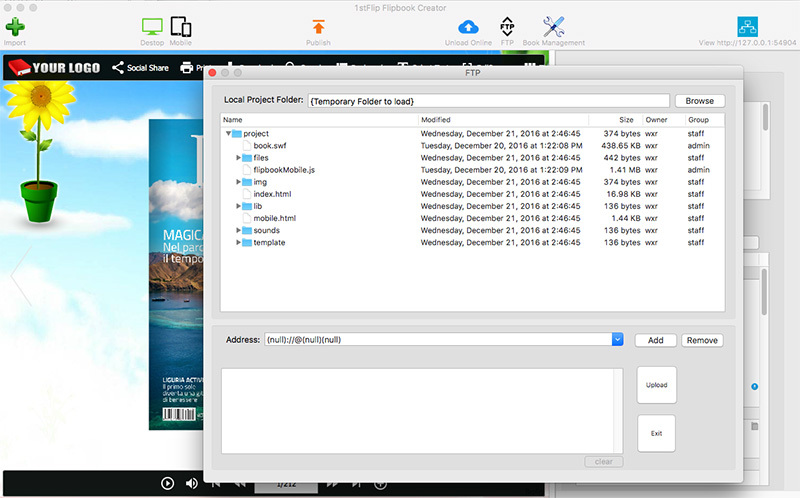 If you have a website or blog, you can upload flipbooks to your website using the built-in FTP. 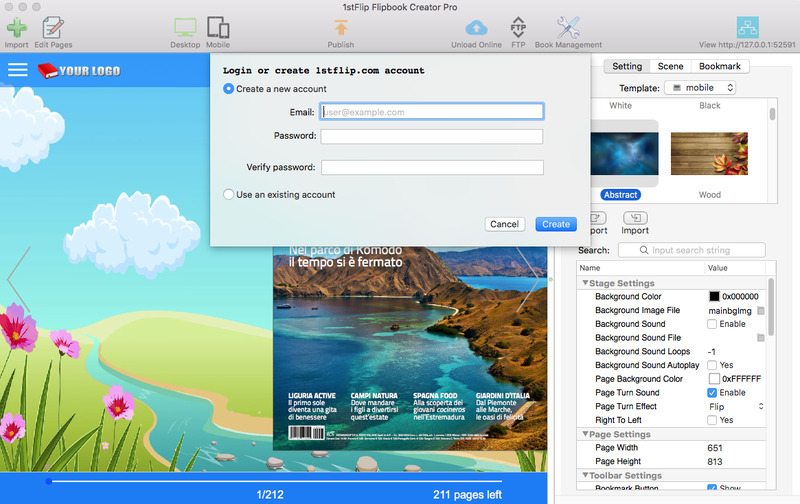 Enter the server address and click Upload to upload your flip books within the Flipbook Creator software. You can also click Publish butoon and convert PDF to flipbook in a folder and upload it anytime you want.